Home» » AP State Level KRIYA Child festival Cultural Competitions 2018. AP State Level KRIYA Child festival Cultural Competitions 2018. AP State Level KRIYA Child festival Inter School Cultural Competitions 2018 Venue JNTU, Kakinada from 27th January 2018 to 28th January 2018 Children Festivals Guidelines Activities Complete Information. Why only in Government Schools. At least 6 KRIYA volunteers reach the school at 9.00am along with material for competitions and prizes. The Day starts with School Assembly. 5 KRIYA volunteers go to 5 classes to conduct the competitions one by one in each class. They finish all the competitions by 1.00pm except Cultural activities. After Lunch, in a open area the cultural activities start, then the prize distribution follows on the same stage. Parents also attend for the afternoon session. 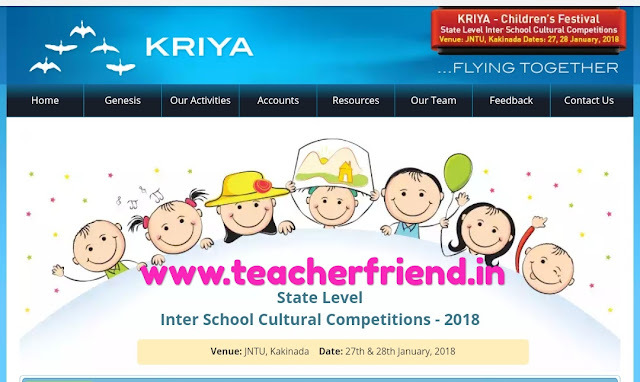 One or Two KRIYA volunteers visit that school and explain everything to the teachers like list of competitions, how to make the children to prepare for each competition and fix the convenient date to conduct the Children Festival leaving at least 10 days gap for preparation. Then the KRIYA volunteers give the practice material for Drawing (Crayons and two sets of papers) to the total strength of the school in Primary and UP Schools. In case of High Schools volunteers give Practice paper for Mathematic basics written test to the total strength. KRIYA asks the feedback from teachers and students, then it makes necessary changes in the future events. KRIYA will send an album of 40 photos and a DVD with photos and videos to the school. Get Download KRIYA Guidelines Events Click Here. Get Apply Online Registration form Click Here.